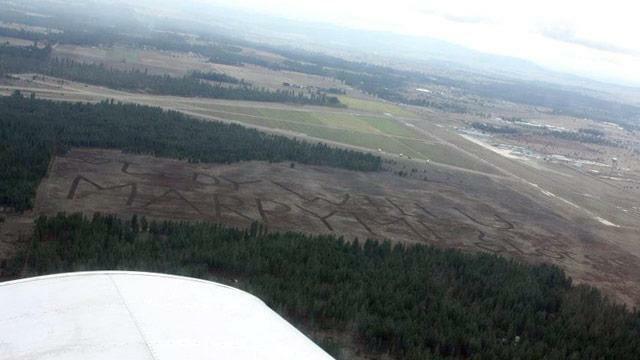 Loren Lentz, of Clayton, Wash., literally plowed his way through his proposal. By any normal standards, Lentz's creative idea to plow his marriage proposal into a 200-acre field just outside of Deer Park Airport would be enough to sweep any farmer's girlfriend off her feet. However, after spending an hour and a half in his tractor getting the "Jody Will U Marry Me" message just right, his 10-year-old daughter, Hailey, pointed out one rather large, and distracting, major detail. Lentz, 37, had plowed the "J" in his girlfriend's name backward, forming an "L" in its place. "Right off the bat, I just said, 'No I didn't,'" Lentz told ABCNews.com. "Then I got to thinking, 'Oh, no, I did do it backwards.' My sister said, 'Why don't you just take some straw and cover it up and redo the J?' But it was a 150-yard-long J, so it would take a lot of hay. And it would be a bright straw spot on the bottom. It just wouldn't look right." Lentz brainstormed for an entire day trying to think of how he could possibly straighten the letter out, but eventually gave up on fixing it, hoping she'd understand his good intentions. The Saturday after Thanksgiving, the weather had cleared just enough for Lentz to have the perfect window of opportunity to take his now fiancée, Jody Schaefer, 29, up in the plane he had arranged for her to discover the surprise proposal from overhead. "We had a service truck stolen this summer and got some information on roughly where it might be. She knew I was going to try to go up to fly to locate the truck," Lentz said. "I had to keep probing her to go up there with me. I told her this was a good little experience to see the local area, take the camera up, and take some pictures and stuff. "I don't know what I would have done if she really put her feet down. She's a very loving person and goes with the flow. She finally said O.K. The pilot was great, a good friend of mine. Once she got up, we searched the area where we thought the truck was. She couldn't distinguish between cars and trucks from up there, so she just started taking scenic photos." During her picture taking, she spotted Loren's name, signed with a heart, plowed into the field. "He wanted me to pull up the camera and take pictures, because I was getting a little woozy looking down so much," Schaefer said. "I was just doing aerial photos. He had asked me to take pictures of his hay stacks. So when I was looking through the little eye lids, I saw his name, Loren." "She saw my name spelled out in the field below. She put the camera down and looked through the view finder, and she knew right away," Lentz said. "She was very excited and gave me a hug over the back of the seat. I already pulled the ring out." Despite the blatant error in her name, Schaefer said yes. "He had this big smirk on his face and was holding the ring and everything. There was no doubt in my mind. It was absolutely yes," Schaefer said. "She's a great, wonderful, loving person. She's way more than I could have ever asked for by leaps and bounds," said Lentz. The happy couple's wedding is already planned for Jan. 19. "We don't believe in long engagements. When you know, you know," said Schaefer.